After a week of hectic mornings rushing out of the house, I'm definitely going to have a nice, proper breakfast at home tomorrow. I came across this simple breakfast table setting over at MyHomeIdeas.com and a close version of this will be recreated in my dining area in the morning. The only thing I'm missing are fresh flowers, but I do have some pretty, artificial ones that will work out just fine. I always enjoy when people take the time to set the table properly for meals, instead of just parking in front of the television with a plate (which I personally probably do a little more than I should). Living in New York, this kind of on-the-go lifestyle is sometimes hard to break away from. 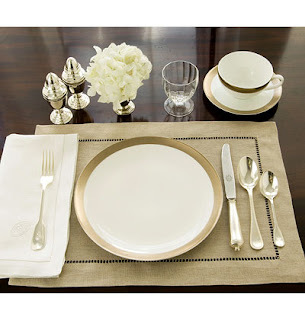 So when I see a pretty table setting like this one, it reminds me that it's really worth the effort, especially since it doesn't take much time at all to put together.